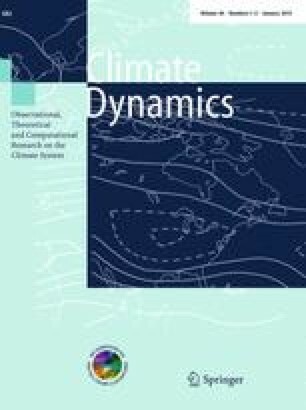 The characteristics of multidecadal variability (MDV) in global land surface air temperature (SAT) are analyzed based on observations. The role of sea surface temperature (SST) variations in generating MDV in land SAT is assessed using atmospheric general circulation model simulations forced by observed SST. MDV in land SAT exhibits regional differences, with amplitude larger than 0.3 °C mainly over North America, East Asia, Northern Eurasia, Northern Africa and Greenland for the study period of 1902–2004. MDV can account for more than 30 % of long-term temperature variation during the last century in most regions, especially more than 50 % in parts of the above-mentioned regions. The SST-forced simulations reproduce the observed feature of zonal mean MDV in land SAT, though with weaker amplitude especially at the northern high-latitudes. Two types of MDV in land SAT, one of 60-year-timescale, mainly observed in the northern mid-high-latitude lands, and another of 20–30-year-timescale, mainly observed in the low-latitude lands, are also well reproduced. The SST-forced MDV accounts for more than 40 % amplitude of observed MDV in most regions. Except for some sporadically distributed regions in central Eurasia, South America and Western Australia, the SST-forced multidecadal variations are well in-phase with observations. The Atlantic Multidecadal Oscillation and Pacific Decadal Oscillation signals are found dominant in MDV of both the observed and SST-forced land SAT, suggesting important roles of these oceanic oscillations in generating MDV in global land SAT. The authors thank Philip Pegion, Taiyi Xu, and Tao Zhang at NOAA/ESRL/PSD for helps in preparing the data. Thanks are also due to two anonymous reviewers for their constructive comments. This work was supported by grants CAS-SPRP XDA05090000 and MOST-NBRPC 2012CB956200.